Work on the Breakwater in Sauteurs has come to a halt. It stopped early this year with rumours that work would recommence in October or November. To date, the work has not restarted, and inquiries were made to the local Parliamentary Representatives as to what the future of the breakwater might be. Questions were asked as to what investigations or assessments had been or will be undertaken to ensure that the destruction of November (2017) does not happen again. Last year we saw the complete loss of the beach in Mt Craven with the sea taking approximately 20 foot of beach and destroying nigh on 65 trees between the Bay and the big drain. The Parliamentary Representatives for St Patrick reassured the inquirers by indicating that the next phase of the project would be implemented to ensure the safety and sustainability of the beach in Mt Craven. This has been budgeted for in project money for the next year. The plan at the moment, is to put rocks along the area from the Bay to the drain in order to mitigate against more destruction in that area. Reassurances were also given that no activity would be undertaken until coastal marine engineers had conducted their assessments and adequate consultation held with the people. In conversations with local fishermen who know the coastline well and have had some schooling in oceanography, they said that the plan for Sauteurs goes back to Dr Friday, who had a vision of what should happen in the town. Yet despite their input as to the structure that would be suitable for the tides and winds in Sauteurs, their indigenous knowledge was ignored, and the breakwater built the way it is now, probably a major factor causing untold damage to the coastline in Mt Craven. 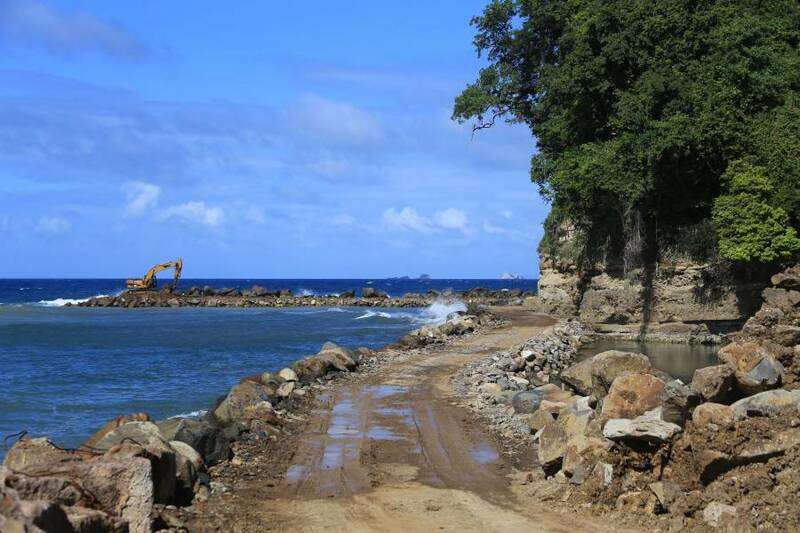 This destruction is now continuing up the coastline with the beach in Mt Rodney being eroded daily with several trees on the verge of falling into the sea and yet despite all of this, the sand mining on Mt Rodney beach continues unabated. The town of Sauteurs has benefited majorly from the construction of the Breakwater, it is no longer at risk from destruction by the sea, however, a comprehensive environmental assessment has to be undertaken in relation to all the coastline before any further projects are initiated anywhere on the island and it needs to be done by appropriately qualified coastal engineers. This was stated clearly in the Coastal Zone Management Policy completed by GIZ in consultation with community groups such as Friends of the Earth – Grenada and Departments of the Government. This policy was ratified by Cabinet in 2015/6 and a Coastal Zone Bill should be on its way to Cabinet in a few weeks. The plan which was meant to come out of the policy in order to inform the way forward for Grenada’s coastal zone and presumably the Bill has not yet been started. Are we putting the cart before the horse once again? The Bill before a proper plan has been thought through? Hopefully, it will have the sustainability and protection of our environment as its primary focus rather than the dollar and exploitation of the coastal zone.